Well, I totally chickened out. I was supposed to read CHARLES DICKENS' 874-PAGED BLEAK HOUSE for several of my reading challenges this month, but I opted for this itty-bitty 54-paged story. Why? Because I stressed out! June is never a pleasant month for me: end of school year celebrations, graduation parties, birthdays, family members visiting, all night dance rehearsal, three-day dance recital (because one isn't enough), week-long Vacation Bible school, and miscellaneous activities with kids!!! I just could not add Bleak House to my chaos. Another time, perhaps. The Strange Case of Dr. Jekyll and Mr. Hyde was certainly enough and just the right size for my circumstance. The format is referred to as a "shilling shocker" because it was sold as an inexpensive (one shilling) shocking novel (of crime or violence), written during the Victorian age. My first thought was that these were great themes and similar to other Victorian age classics, Frankenstein and Picture of Dorian Gray, but my second thought was that I didn't care for the story much. That makes two Robert Louis Stevenson books that didn't light my fire. The other was Treasure Island, though it was years ago when I read it. In the case of Dr. Jekyll and Mr. Hyde, I think what I disliked most was the short format, disconnection from characters, and mystical plot. It isn't that I do not care for the mystery aspect altogether, it is because many of the specifics are unexplained, and the reader is left to piece it together and assume details. 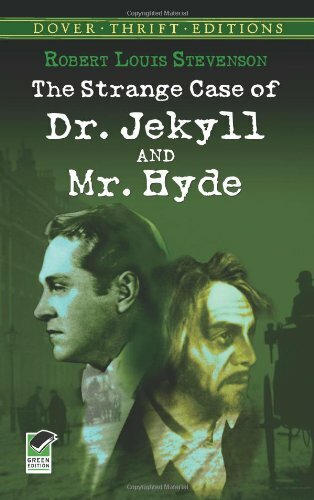 We are not informed of all the secret sins practiced by Mr. Hyde, but whatever they were, they must have been horrid because they had to be kept hidden. And there is hardly time to know the characters in depth. Simply put, the plot involves the character Mr. Jekyll, who is considered upstanding and righteous in the community. Then there is this mysterious wicked, evil man, Mr. Hyde, running loose about London. The character, Mr. Utterson, is determined to find out what the dangerous Mr. Hyde's connection is to his good friend and client, Mr. Jekyll. He doesn't learn until the very end, which I cannot share without revealing spoilers. One theme presents man's two natures at odds with each other. Man wants to be good and righteous, but he is often at war with his rebellious side. This is true for the man who is conscious of his rebelliousness, and it becomes a constant battle to fight against his wickedness. It appears that Jekyll tried to physically separate himself from his wickedness. It was as if he split his personalities and appeared in society as two different men. But his wicked man got away from him, overpowered him, and destroyed him. Another theme is how humans usually put on their best man in society. We want to be accepted and revered and respected; hence, we try to follow the rules of civility and remember to act proper and use manners when we are in public. This is difficult, especially when we fight or hide our natural desires to be selfish, greedy, crude, perverse, and whatever else our rebellious heart feels like. But that is too bad because we should always strive to do what is good and right, even if it is difficult and even if we falter sometimes. If Stevenson is arguing that man should not repress those natural desires because they will drive us mad, then I disagree with him. But I am not sure I totally understand his arguments. There are numerous other themes running through the short plot, but I did not get them during my reading. I only read about them afterward, so I will not include them here. I wish I would have had time to read Dickens or even North and South by Gaskell for my Victorian Challenges, but I would have never made it to the end of the month. It has even taken me two weeks just to write this, and my June is still not over, yet. I was completely shocked by this book -- I read it for the first time last year, and and I was expecting it to be kinda sci-fi (like "The Invisible Man") and horror-ish, and instead, I found it to be a thoughtful exploration of the idea of original sin, and of how we can become entranced by our own sinful desires. Dr. Jekyll at first thought he was able to purge himself of his baser nature, but instead discovered that sin is fun. He transformed over and over for the sheer pleasure of it. His baseness and depravity, which had always been within him but which he previously had been able to control, ran riot -- I think it was giving in to his natural inclination to sin that drove him mad, not fighting them. At least, that's what I took away from it. Hope your summer calms down! Hamlette, I like your synopsis much better. I struggled with the particulars and only brushed the surface. I do that with Victorian lit. I agree that Jekyll did enjoy his sin. I also thought maybe he was trying to live two lives: in public, he was the righteous, upstanding gentleman, but in secret he enjoyed his sinfulness. I think I would need to review this one again to have a better understanding of Stevenson's argument. This is the third time I'm trying to comment. My google account is giving me problems. Anyway, :) I must confess that I love Stevenson, at least his poetry because so many composers have put music to it. This story is very strange. Is S. trying show that man shouldn't play God and experiment on humans (even oneself) or is he showing despair that man can never over come his depraved state. I don't think S. was a Christian which may explain the lack of hope in his conclusion. Thanks for a good review! Sorry about that. It happens to me, too. I think I need to reread this again some day in order to understand Stevenson's argument. At this point, I am not confident what it could be. Certainly his worldview would play a role in determining what he wanted to convey. I had mixed emotions on the lack of graphic detail of Hyde's sin. On one hand, I was anticipating more of a thrill ride, on the other I appreciate what I think was at least partially an intent, more typical of 19th century, to be a little delicate and spare the loathsome details. I didn't have trouble believing Hyde must be very wicked...Jekyll would certainly know, and certainly thought so, but it still lacked a little force. Still an interesting read.